The day I discovered electric grills changed my life forever, mostly because I love melty cheese sandwiches. As soon as I discovered my undying love for them, I also found that I absolutely loathe cleaning them. I would rather clean an entire sink of dishes than have to wash an electric grill. I die. 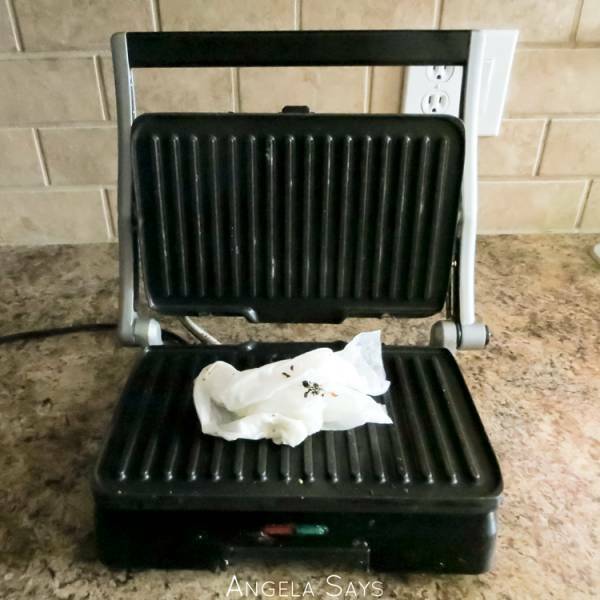 However, since I hate cleaning my little electric grill, I have found an easier, less soul sucking way to clean it. Once it’s done cooking your perfectly moist chicken breast, unplug it and let it cool just a little bit. Place wet paper towels over the grill plates. You want to place the paper towels on while the grill is still warm so it promotes some steam to loosen the cooked on grease and grime. Close the grill and let it sit until cool. 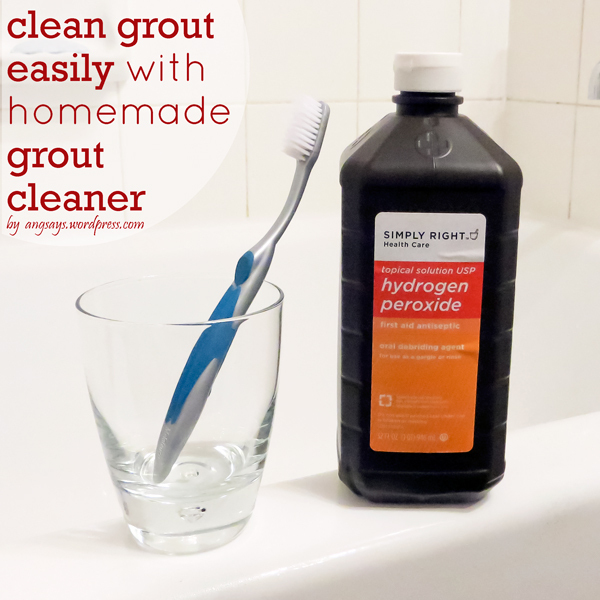 Once the dried on crud re-moistens, it’ll wipe away easily instead of making you curse the crud’s very existence. 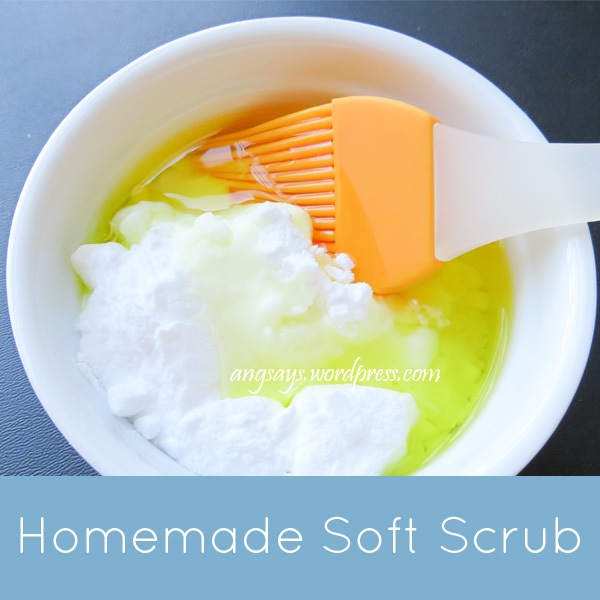 Use the paper towel or grab a cleaning cloth that has been dipped in hot soapy water and wipe the mess away. 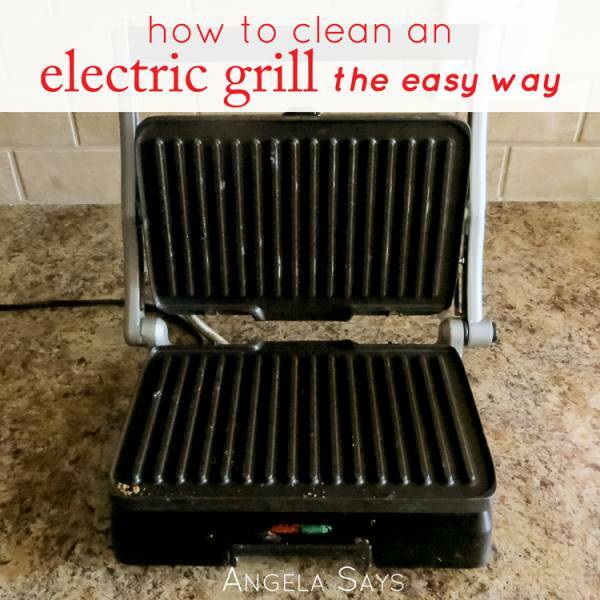 No more do I try and scrub away the dried fat and cheese from the grill and this is the easiest and fastest way I have found to clean electric grills. Although I did upgrade in life and this particular grill’s plate pop right off and I can stick them in the dishwasher. Technically, that is easier, but if your grill plates do not pop off then the paper towel method works wonders. Thanks for sharing this bit of information. My daughter-in-law has one of those grills that do not have removable plates. It is a pain in the neck to clean or should I say is no longer a pain in the neck to clean with the information you have shared with us. Have a wonderful and safe weekend! Thanks! 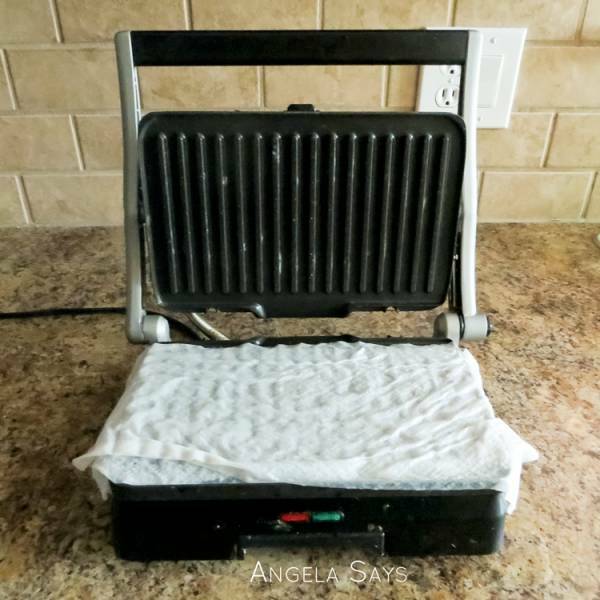 The removable grill plates are so wonderful, but I still use this method when it’s not too dirty and I want to use it again quickly. That sounds like a great way to clean the grill, i also read where a young lady found a very easy method, she puts foil on the grill plate both top and bottom and then cooks, and then just throws the foil away. That’s a great idea Joy. I would probably use that if I was going to grill multiple things in one night. Great idea. I always hate having to clean the grill once I’m done. This will make it much easier! I’m glad I’m not the only one who hates cleaning the grill. Thanks for stopping by Cheryl! So I tried this out the other day on my grill. It was amazing!! I let the paper towels sit in the grill for about 5 minutes (at most). The grill was so easy to clean. Thanks for the great tip, Angela! You’re welcome Becky! I’m so glad this tip worked out for you. Thanks for stopping by. What a great idea!!! I will have to give this a try. I would love it if you linked this to my Motivate Me Monday linky party on IT’S A ginger SNAP. You’re welcome! Thanks so much for stopping by!! You must be an angel for sharing this 🙂 I am sure I have the dirtiest electric grill in the world but it isn’t easy cleaning. We cannot wash and use chemicals. I am going to try this method. Hoping for a good result! I use the heavy duty non-stick Reynolds Wrap. Place wrap shiny side down on the lower grate. Place food on the dull non-stick side. 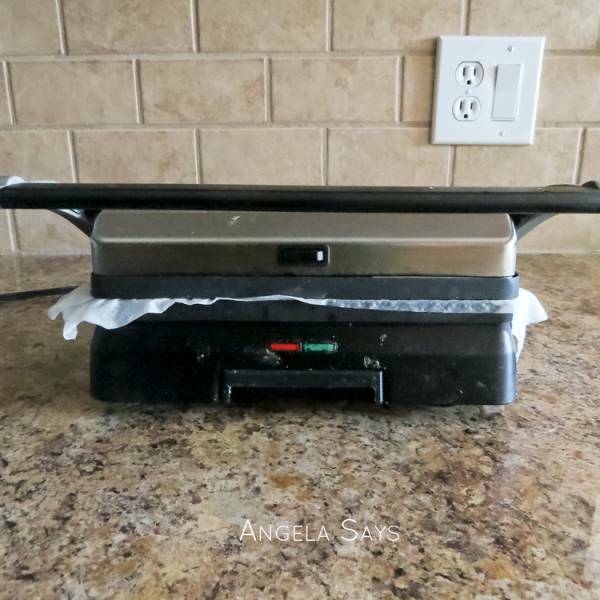 Place another piece of Reynolds Wrap over food with the dull non-stick side on the food and the shiny side will be against the top grate when the George Foreman Grill is closed. The grill stays clean and food does not stick. Still preheat the grill first; non-stick grill spray is no longer used either. Wonderful idea!!! thanks for sharing this and you made our day. Very interesting content. 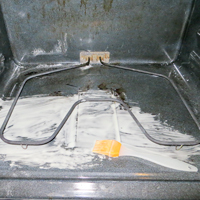 I used to clean my grill with an oven cleaner but it used to leave a white residue all over the grill. My wife was afraid to use it again. I will try this technique now.